Maxwell Lemuel Roach (January 10, 1924 - August 16, 2007) to parents Alphonse and Cressie Roach. 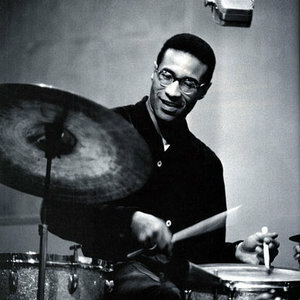 He was a world-class percussionist, drummer, and jazz composer. In 1952 Roach co-founded Debut Records with bassist Charles Mingus. This label released a record of a concert, billed and widely considered as "the greatest concert ever," called "Jazz at Massey Hall," featuring Charlie Parker, Dizzy Gillespie, Bud Powell, Mingus and Roach. Also released on this label was the groundbreaking bass-and-drum free improvisation, "Percussion Discussion." In 1952 Roach co-founded Debut Records with bassist Charles Mingus. This label released a record of a concert, billed and widely considered as "the greatest concert ever," called "Jazz at Massey Hall," featuring Charlie Parker, Dizzy Gillespie, Bud Powell, Mingus and Roach. Also released on this label was the groundbreaking bass-and-drum free improvisation, "Percussion Discussion." In 1954, he formed a quintet featuring trumpeter Clifford Brown, tenor saxophonist Harold Land, pianist Richie Powell (brother of Bud Powell), and bassist George Morrow, though Land left the following year and Sonny Rollins replaced him. The group was a prime example of the hard bop style also played by Art Blakey and Horace Silver. Tragically, this group was to be short-lived; Brown and Powell were killed in a car accident on the Pennsylvania Turnpike in June 1956. After Brown and Powell's deaths, Roach continued leading a similarly configured group, with Kenny Dorham (and later the short-lived Booker Little) on trumpet, George Coleman on tenor and pianist Ray Bryant. Roach expanded the standard form of hard-bop using 3/4 waltz rhythms and modality in 1957 with his album Jazz In 3/4 Time. During this period, Roach recorded a series of other albums for the EmArcy label featuring the brothers Stanley and Tommy Turrentine. In 1960 he composed the We Insist! - Freedom Now suite with lyrics by Oscar Brown Jr., after being invited to contribute to commemorations of the hundredth anniversary of Abraham Lincoln's Emancipation Proclamation. Using his musical abilities to comment on the African-American experience would be a significant part of his career. Unfortunately, Roach suffered from being blacklisted by the American recording industry for a period in the 1960s. In 1966 with his album Drums Unlimited (which includes several tracks that are entirely drums solos) he proved that drums can be a solo instrument able to play theme, variations, rhythmically cohesive phrases. He described his approach to music as "the creation of organized sound." Among the many important records Roach has made is the classic Money Jungle 1962, with Mingus and Duke Ellington. This is generally regarded as one of the very finest trio albums ever made. During the 70s, Roach formed a unique musical organization -- M'Boom -- a percussion orchestra. Each member of this unit composed for it and performed on many percussion instruments. Personnel included Fred King, Joe Chambers, Warren Smith, Freddie Waits, Roy Brooks, Omar Clay, Ray Mantilla, Francisco Mora, and Eli Fountain. Not content to expand on the musical territory he had already become known for, Roach spent the decades of the 80s and 90s continually finding new ways to express his musical expression and presentation. In the early 80s, he began presenting entire concerts solo, proving that this multi-percussion instrument, in the hands of such a great master, could fulfill the demands of solo performance and be entirely satisfying to an audience. He created memorable compositions in these solo concerts; a solo record was released by Bay State, a Japanese label, just about impossible to obtain. One of these solo concerts is available on video, which also includes a filming of a recording date for "Chattahoochee Red," featuring his working quartet, Odean Pope, Cecil Bridgewater and Calvin Hill. He embarked on a series of duet recordings. Departing from the style of presentation he was best known for, most of the music on these recordings is free improvisation, created with the avant-garde musicians Cecil Taylor, Anthony Braxton, Archie Shepp, Abdullah Ibrahim and Connie Crothers. He created duets with other performers: a recorded duet with the oration by Martin Luther King, "I Have a Dream"; a duet with video artist Kit Fitzgerald, who improvised video imagery while Roach spontaneously created the music; a classic duet with his life-long friend and associate Dizzy Gillespie; a duet concert recording with Mal Waldron. He wrote music for theater, such as plays written by Sam Shephard, presented at La Mama E.T.C. in New York City. He found new contexts for presentation, creating unique musical ensembles. One of these groups was "The Double Quartet." It featured his regular performing quartet, with personnel as above, except Tyrone Brown replacing Hill; this quartet joined with "The Uptown String Quartet," led by his daughter Maxine Roach, featuring Diane Monroe, Lesa Terry and Eileen Folson. Another ensemble was the "So What Brass Quintet," a group comprised of five brass instrumentalists and Roach, no chordal instrumnent, no bass player. Much of the performance consisted of drums and horn duets. The ensemble consisted of two trumpets, trombone, French horn and tuba. Musicians included Cecil Bridgewater, Frank Gordon, Eddie Henderson, Steve Turre, Delfeayo Marsalis, Robert Stewart, Tony Underwood, Marshall Sealy, and Mark Taylor. Roach presented his music with orchestras and gospel choruses. He performed a concerto with the Boston Symphony Orchestra. He wrote for and performed with the Walter White gospel choir and the John Motley Singers. Roach performed with dancers: the Alvin Aily Dance Company, the Dianne McIntyre Dance Company, the Bill T. Jones/Arnie Zane Dance Company. In the early 80s, Roach surprised his fans by performing in a hip hop concert, featuring the artist-rapper Fab Five Freddy and the New York Break Dancers. He expressed the insight that there was a strong kinship between the outpouring of expression of these young black artists and the art he had pursued all his life. During all these years, while he ventured into new territory during a lifetime of innovation, he kept his contact with his musical point of origin. His last recording, "Friendship", was with trumpet master Clark Terry, the two long-standing friends in duet and quartet.